The European Championship of young professionals is entering a new round. This year, Europe's most talented young skilled professionals compete to be the best of the continent and will have the opportunity to showcase their knowledge, skills and talent at the EuroSkills competition in Budapest between September 26 and 28. We are full sponsor of the Mechatronics competition and joint sponsor of the Industrial Control competition. Together with Siemens, we are organizing the Industry 4.0 Training Camp in hall B at booth 4O. Here, four teams are working on typical Industry 4.0 topics, such as IT-Security, RFID systems, MES, or network technology. In cooperation with Adiro, we are informing about Water Technology – a new skill that will have its debut in the skills competition at WorldSkills Kazan in 2019 – at our information booth in hall B at booth 4S. 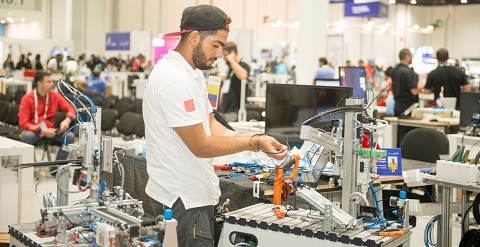 As part of “try a skill” in hall D, visitors will have the exciting chance to try out different skills in an interactive way and gain hands-on experiences. We would also happy to welcome you at our Festo VIP stand in hall G at booth 23. Do you wish to be updated on news about what is going on at EuroSkills? Follow us on Facebook or LinkedIn! Do you want to learn more about the event?